Australian native orchids fall within the scope of both the Society for Growing Australian Plants and Orchid Societies. They are so popular that the specialist Australasian Native Orchid Society (ANOS) has 20 active groups throughout Australia and affiliations with New Zealand and New Guinea native orchid societies. ANOS sponsors Australasian conferences every three years which average over 200 registrants. What other group of Australian plants has this following? There are 107 orchid genera containing more than 800 species growing in Australia. Most are unique to this country. About ten new species are discovered each year as botanists study these plants using modern technology. Field observations of insect pollinators can aid in drawing boundaries around species, as many orchids have specific pollinators. 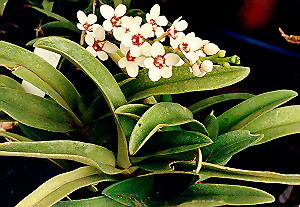 Australian orchids are divided into two groups for culture and show purposes. The first group are the epiphytes, which means 'growing on trees'. The rock growers are usually included because they require the same cultural conditions. 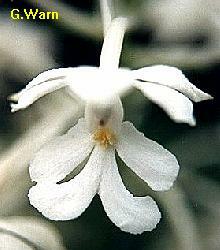 About one quarter of Australian orchids are epiphytes. They occur in a narrow coastal band across northern Australia and down the east coast to Tasmania. Those with fat, water-storing pseudobulbs do well in Adelaide provided they are watered frequently in summer. 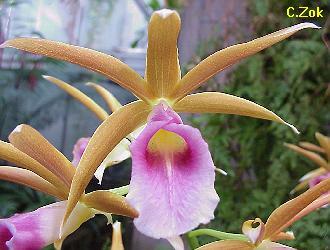 Epiphytes are by far the most common in orchid collections. Probably the easiest to grow are the varieties of Dendrobium speciosum, the rock orchid, which has stout pseudobulbs topped with large leathery leaves. The robust flower racemes can carry up to 100 white or yellow flowers in spring. Other popular plants are D. x delicatum, and D. 'Bardo Rose', both spring flowering, and D.'Hilda Poxon' which has a long flowering period from late summer through to spring. Dendrobium "Bardo Rose" (left) is a beautiful and easily grown hybrid of D.falcorostrum and D.kingianum. Dendrobium linguiforme (right) is known as the "tongue orchid" because of the shape of the leaves. Select the thumbnail image or highlighted name for a higher resolution image (23k and 29k). There are hundreds of hybrids being created by numerous nurseries every year to cater for the pot plant trade which demands new colours, shapes and flowering season. Most of the epiphytes traditionally grown in Adelaide flower in spring where they are a feature of spring shows. My favourite species is D.falcorostrum, the beech orchid, which occurs naturally on Antarctic Beech trees near Dorrigo at the top of the Great Dividing Range in New South Wales. It doesn't like Adelaide's summers or salty water, but thrives in winter rain and looks magnificent when covered with 40mm diameter, fragrant white flowers in spring. Creeping epiphytes such as D.linguiforme, the tongue orchid, and the humidity loving Sarcochilus hartmannii add character to an orchid collection. This group of plants is grown in pots of coarse bark and pebbles or mounted on hardwood or cork slabs. They require almost daily watering and some form of shading in summer. Most growers use shadecloth and move the plants under a plastic roof during flower bud development. The flowers of Australian orchids are small by tropical orchid standards but the large number of flowers often covering the plant makes up for it. Terrestrial (growing in the ground) species outnumber the epiphytes 3 to 1 and grow over a wider range, including the southern parts of Australia. A few survive far inland in favourable habitats. The majority are deciduous and die down to an underground tuber in the dry season, which is summer in Southern Australia. Terrestrial orchid seed is like fine dust and has no stored food source to aid germination and early growth. In the bush, orchid seed requires the help of a micorrhizal fungus for seedling development. Some species are dependent on the fungus association throughout their life cycle, whereas some adult plants can thrive without fungus. When I became interested in cultivation 30 years ago, terrestrials were thought to be virtually impossible to grow in pots. Now we know that some are easy, some are still very difficult and some are so rare that no material is available for cultivation experiments. We are successfully growing more than 150 species. There are probably another 100-150 species grown somewhere in Australia. Refer to Table 1 for a list of genera in cultivation. Orchid species from these genera are amenable to current methods of cultivation in pots. Photos: Ivan Margitta, Australian Plants Society, Jill Dark. Select the thumbnail image or highlighted name for a higher resolution image (23k, 19k, 14k, 13k). Thelymitra ixioides, Dotted sun orchid. Photos: Jill Dark, Jim Lawler. Select the thumbnail image or highlighted name for a higher resolution image (37k, 24k, 19k, 21k). Deciduous terrestrials thrive in a shadehouse of 50-70% shadecloth. In very cold areas, or where summer rain is heavy, a plastic roof is usually added. Light frost to -2oC does not worry the majority of species. All terrestrials like good air movement and will not thrive in a stuffy humid atmosphere, especially if temperatures are high. Some species prefer heavy shade, others full sunlight, but most will adapt to a wide range of light intensity. The spring flowering species prefer highter light values at flowering time. It is essential to keep pots up off the ground on benches to deter slugs and snails. I like to use plastic pots because they are easier to clean and sterilize. Pot size should be neither too big nor too small. I recommend 125mm standard pots up to 175mm squat pots for specimen groupings of 20 plants. The potting soil must be kept uniformly moist during active growth. If the pots are allowed to dry out during the growing season, the plants may become dormant. Fertilisers are not necessary, although Pterostylis species are very hardy and will benefit from weak applications of foliar feed applied whilst the leaves are developing. New tubers are produced in winter-spring. The colony types form several tubers per plant and within a few years the pots would become overcrowded if not repotted. I recommend annual repotting for these. Some of the showier species produce only one new tuber each year and have to be propagated from seed. Some of these can be made to produce a second tuber by carefully twisting off the new season's tuber in September/October and replanting the plant with the old tuber still attached for another month or two. This method works well with Diuris and the rufa group greenhoods. As the days get hotter and drier in late spring, the leaves of terrestrials go yellow and then brown and dry. After the leaves have turned brown, the pots are allowed to dry out completely to dry up the old roots and tubers. Terrestrials must be given their own growing area, well away from evergreen plants which are watered regularly in summer. The tubers may rot if kept wet in hot weather. Seed pods ripen before the plants become dormant. Pods are checked daily and picked as they start to split open. Seed is stored in paper envelopes until autumn. In summer the plants are knocked out of the pots and the new plump, firm tubers are repotted into fresh soil mix. My mix is 45% loam, 50% sand and 5% peat moss with a small amount of blood and bone fertiliser added. It has a pH of 5.5. Growers in other states use coarser mixes containing fine gravel and with leaf-litter or buzzer chips in place of peat moss. The new tubers are replanted with the tops 20-40mm below the soil surface. A thin surface mulch of Casuarina or Pinus radiata needles, chopped to lengths of 20-50mm, prevents erosion and keeps the leaves clean and healthy, as well as improving the appearance of the pot. Repotting is normally done in November, December or January. Each tuber sends up a shoot to the surface in autumn. The leaves grow rapidly in late autumn and early winter as the rains set in. Seed can be sprinkled on top of the pots around mature plants in autumn. Protocorms develop in the cool, wet winter conditions and seedling leaves appear in spring. Seedlings produce tiny tubers by summer. Only the largest usually survive the long dry dormancy period of 4-6 months. Some species set seed unaided but most require hand pollination. I use a piece of pine needle to transfer pollen from one flower to another of the same species. The flower collapses within a few days if pollination is successful. Seed pods develop rapidly and in springtime can ripen in 4-6 weeks. The four commercially important deciduous terrestrial genera in cultivation are Caladenia, Diuris, Pterostylis and Thelymitra. Each genus has a large number of species, although not many Caladenia are in general cultivation. I am growing more than 50 terrestrial hybrids in pots and have a number of others in flask. We have been very successful with the sun orchids or Thelymitra. All the colour of the rainbow, including the most beautiful blues, are found in the sun orchids. For exhibition work Thelymitra are poor subjects because the flowers close at night and will not open unless the temperature rises above 22oC. They can be made to open on cool sunny days if the pot is placed inside a closed car. Thelymitra are all spring/summer flowering orchids in southern Australia. They are very striking plants, some growing more than 50cm tall with up to 20 flowers. The smaller species are the easiest to cultivate. Photos: Tony Rodd, Jill Dark, John Emms, Alfred Guhl. Select the thumbnail image or highlighted name for a higher resolution image (24k, 60k, 40k, 34k). There are a few evergreen terrestrials from the tropics which are widely grown. Two which come to mind are Phaius tankarvilliae the Queensland swamp orchid, which has 90mm pink, white and brown flowers and Calanthe triplicata the Christmas orchid, which has a cluster of white flowers on top of a tall stem. As good areas of bushland shrink year by year, those that remain become more precious. Will our great great grandchildren be able to see the full range of species orchids or will they only be preserved in herbaria and on video. It is up to us to efficiently manage the bush habitats that are left and try to restore the degraded sites. Those species that are amenable to cultivation must be propagated from seed and carers must be trained to look after them. It will take a sustained effort to keep our wonderful Australian orchids alive and well. Native Orchids of Australia, David Jones, Reed Books. The Orchids of South Australia, Weber & Bates. It's Blue with Five Petals, Ann Prescott. Plants of the Adelaide Plains and Hills, Gilbert R.M. Dashorst & John P. Jessop. Les Nesbitt has been interested in native orchids for more than 40 years as a propagator, hybridiser and exhibitor. He is the custodian of 20 hectares of bushland in the Adelaide hills containing 29 orchid species. Les was the inaugural president of the Native Orchid Society of South Australia and is an accredited judge of both native and exotic orchids. Since 1975 he has run Nesbitt's Orchids, a nursery specialising in propagating Australian deciduous terrestrial orchids for growers everywhere.